The Mane Objective: How Much Breakage is Normal for Natural Hair? How Much Breakage is Normal for Natural Hair? In my short time as a blogger in the natural hair community, I've come to realize that there is one word that incites an unparalleled fear and universal panic in naturalistas across the board: breakage. The dreaded (accidental) snap, the tiny wisps of hair on the sink, or the awful realization that more of the longer hairs that you thought were shed are actually broken is enough to have you re-examine every hair decision you've made in life. What is breakage? How is it different from shedding? Simply put, breakage is any hair that comes from your head that does not have a whitish bulb on the end. That whitish bulb is your visual cue that the hair came directly from the root, and nowhere else. If there is no bulb, there is no shedding, period. 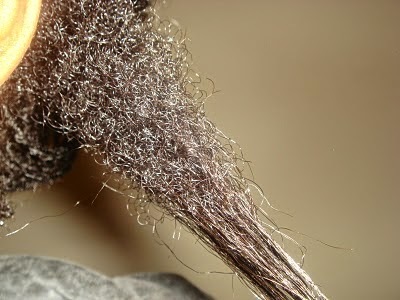 A common misunderstanding is that longer hair is automatically shed hair whereas shorter wisps of hair are breakage. Breakage nor shedding knows no length. If you can't see the bulb, feel for it on the end of the hair strand. If you can't feel a slight bump, then it's breakage. Why do I have breakage? 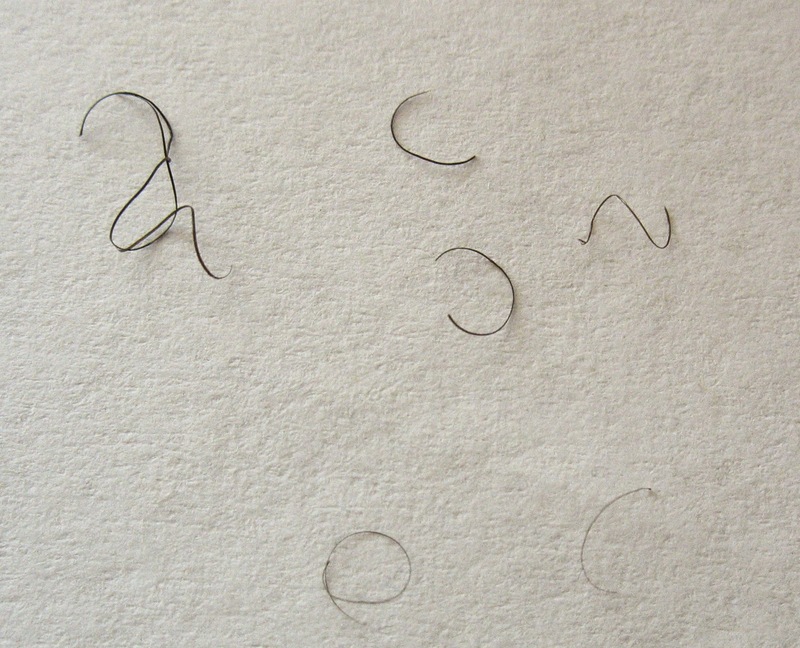 Shedding is a normal part of the hair growth life cycle, whereas breakage is not. Breakage is caused by us and the things we do to our hair. One of my favorite quotes about natural hair breakage comes from Jc of The Natural Haven, "A very common question is 'why does my hair break'. My very scientific answer is.....because you broke it." Breakage is typically caused by a number of things -- how we handle our hair (combing, brushing), to abusing the cuticle layer (too much stretching or heat), chemical processes (hair dye), environmental factors, and dryness. Our highly textured natural hair is structurally weaker than straight hair, which means our hair is more inclined toward breakage with less force. This also means that we must be much more delicate with our tresses. So, how much breakage is normal? Now we get to the good stuff. In all honesty, there is no solid scientific figure for how many pieces of breakage hair are considered normal. Trust me, I looked. In fact, the immediate answer that most sources disclose is that no amount of breakage is considered normal. However, many of those same sources also share that the expectation of zero breakage is unrealistic. No matter how careful and gentle you are with your hair, a few wisps of hair or an accidental snap are bound to happen. The main objective (haha) of your natural hair regimen should always be to minimize and prevent as much breakage as possible, while not beating yourself up if you lose a few wisps on wash day. Professional stylist and healthy hair advocate Lawrence Ray Parker shared, "If you lose a few strands here or there, it's not a big deal. But hair that is consistently breaking in large quantities is a problem." From personal experience, seeing 3-6 pieces of breakage hair on wash day is what I consider normal. Some of you may staunchly disagree, but I have found that to be completely within my regular range of hair loss that does not too adversely impact my length retention efforts. I'm sure I could get down to zero breakage if I really wanted to (by incorporating more protective styling), but I have zero interest in surrendering my wash and go's. In this article geared specifically toward 4b and 4c natural hair, Jc of The Natural Haven shares that 10 or less little wisps of hair on wash day or during detangling is no cause for concern. Some naturalistas stand firm on the fact that no breakage whatsoever is acceptable, and if you're one of them and it works for you, wonderful! You're the real MVP. This article is really for the ladies who while detangling, see a few broken hairs and wonder if it's worth the panic. You are not alone, I am here with you. Don't panic, a little breakage is okay. But if the amount of breakage you see starts to increase regularly...then you might want to take a few steps back. According to the Journal of Investigative Dermatology (2007), Black women in particular are at risk for hair breakage due to various practices that weaken the hair shaft, and the dry nature of the hair (our sebum has more difficulty traveling down the shaft than straight hair). In addressing breakage, "the combing and brushing habits, washing frequency, drying process used, hair care products used and how they are applied, and any chemical processes performed on the hair must be researched...at least 6 months before the first observed hair breakage." Again, if you are experiencing minor breakage, like seeing a few hairs on the sink after not detangling for two weeks, this does not necessarily apply. However, if you are experiencing severe hair trauma with what appears to be significant breakage every single time you touch your hair, then it's time to take a look 6 or so months back. Did you change something significantly in your regimen? Perhaps you used to be a devout deep conditioner, and started cutting corners to save time. Or maybe you're ripping combs through your hair instead of taking the time to finger detangle or work in smaller sections. Did you recently color your hair? How's your moisture-protein balance looking? How do you layer products in your hair? All of those are important factors to take into consideration when examining the source of breakage. Of them all, Lawrence Ray Parker finds that the most common culprit is dehydrated hair. "When you're not moisturizing your hair enough, or deep conditioning regularly, that's when it happens the most. Dry hair is much more prone to breakage." If you suspect your breakage may be mechanical in nature (i.e. you're handling it rough or detangling it the wrong way), then you've got the easiest fix. Switching from combs to patiently finger detangling in smaller sections can help you significantly minimize breakage. Also, be sure to examine your detangling method altogether. Hair is weakest when wet, but also more elastic and easier to detangle. Dry hair has greater tensile strength, but also can be more difficult to detangle. Dry, wet, or somewhere in the middle? It all depends on what works best for your hair. Try different methods and combinations until you find your groove. If your hair seems brittle, and you don't have a major medical condition or complication, nor have you had any chemical services (color), your hair is likely begging for moisture. Finding a good deep conditioner that is water-based, and contains lots of butters and oils to moisturize and soften the hair is key. Products like TGIN Triple Moisture Replenishing Conditioner, Giovanni Nutrafix, and Shea Moisture's Superfruit Complex 10-in-1 Hair Masque are perfect for this. Moisturizing deep conditioners will help to greatly improve the elasticity of the hair, lessening the likelihood of breakage. Hair that feels rough, is highly porous, and breaking is often associated with a protein imbalance or cuticle damage. This damage can be cumulative due to certain haircare practices (like frequent blow dryer use or stretching), or from a dye job. This calls for a moisture-protein balance, and relying heavily on deep conditioners that infuse hydration and strengthening while helping to keep cuticles closed and flat. Some of my personal picks include ApHogee's Keratin 2 Minute Reconstructor (it worked miracles after I got my hair dyed in October), ApHogee Curlific Texture Treatment (review), Eva NYC Therapy Session Hair Mask (review), Shea Moisture Jamaican Black Castor Oil Treatment Masque (review), and of course, a good ol' fashioned apple cider vinegar rinse. Although I do believe a good deep conditioning regimen can solve a multitude of hair problems, there are a few other provisions to take into consideration when remedying breakage. If you find that your breakage is primarily on the ends of your hair, keeping them sealed with heavier oils like Jamaican Black Castor Oil can help keep them from snapping so easily. To help ease mid-shaft breaks, in addition to the suggestions above, try incorporating leave-in sprays that contain proteins to help keep hair strong in-between wash days. I like to keep ApHogee Keratin and Green Tea Restructurizer Spray, Infusium 23 Repair and Renew Pro-Vitamin Leave-In (review), and LRC Shake & Go (review) handy for that purpose. If you're transitioning and experiencing breakage, you must be extra careful with the line of demarcation. Click here to learn more about preventing breakage in transitioning hair. 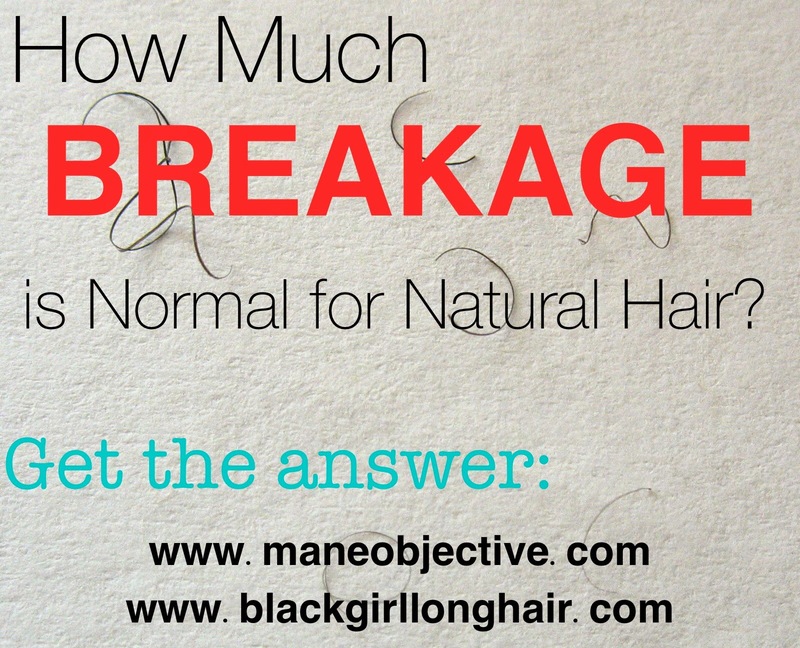 So ladies, how much breakage do you consider normal? What are some of your tips and tricks for minimizing breakage?